The Corsair was a single seat, single engined monoplane, designed as a land or carrier based fighter aircraft by the Chance Vought Aircraft Corporation at Stratford, Connecticut, U.S.A., where the Model F4U-1 was built. Two other aircraft companies were also licenced to build the Corsair aircraft, as the war progressed namely, Brewster Aeronautical Corporation, Long Island City, New York (Model F3A-1 & F3A-1D) who built a total of 735 and the Goodyear Aircraft Company, Akron, Ohio (Model FG-1, FG-1A & FG-1D) totalling 4,007 aircraft. By the end of 1944, Chance Vought were producing 300 Corsair's a month or one complete aircraft, every 82 minutes. 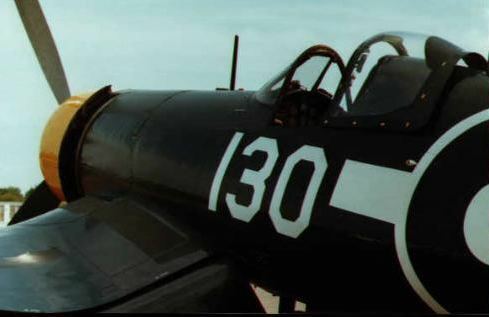 5,380 F4U Corsair's were built in 1944, 2,673 of which were built by Chance Vought, 599 by Brewster Aeronautical and 2,108 by Goodyear. Hydraulically powered wing folding mechanisms, alighting and arresting gear, landing gear and wheel brakes were provided in the aircraft. The main landing gear retracted completely into the wings and the tail wheel and arresting gear retracted partically into the fuselage. 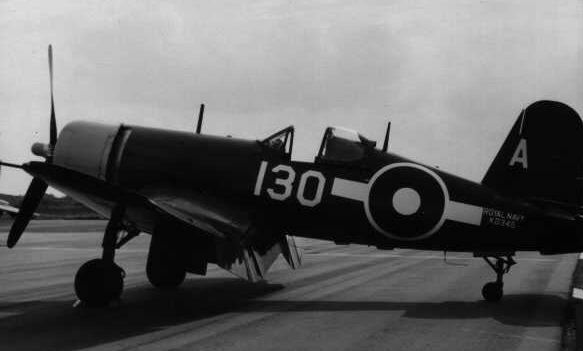 The distinctive characteristics of the Corsair, was the long fuselage and inverted 'gull wing' design. The Royal Navy modified the Corsair's it was loaned, under the Lend Lease Agreement with the United States, by 'clipping' eight inches from each wing, thus allowing them to fit into the lower height hangars of the British Aircraft Carriers. The landing gear was also modified to allow for heavier deck landings. The Royal Navy were the first, operationally, to use Corsair's on Aircraft Carriers and their first action was against the German Battleship "Tripitz" in March 1943. The first Royal Navy Corsair Squadron, No. 1830, was formed at U.S.N.A.S. Quonset Point, Rhode Island on the 1st June 1943. The US Navy did not like the Corsair, due to 'landing on' difficulties, from the straight approach, they could not see the flight deck and gave them to the US Marines on shore bases. The Royal Navy perfected the 'landing on' procedure, by taking a curved approach in preparation for 'landing on'. There were a total of 13 Royal Navy Corsair Squadrons, by the end of the war, totalling 255 aircraft, No.1831 Squadron on H.M.S. 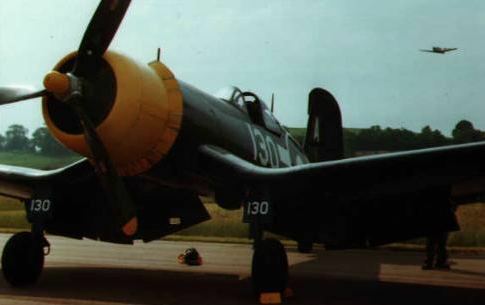 Glory had 21 Corsair Mk. 'IV', No.1834 Squadron and No.1836 Squadron on H.M.S. Victorious had 18 Corsair Mk. 'II & IV's each, No.1835 attached to Belfast, N.Ireland had 21 Corsair Mk. 'IV', No.1837 attached to Nutts Corner, N.Ireland had 21 Corsair Mk. 'III', No.1841 Squadron and No.1842 Squadron on H.M.S. 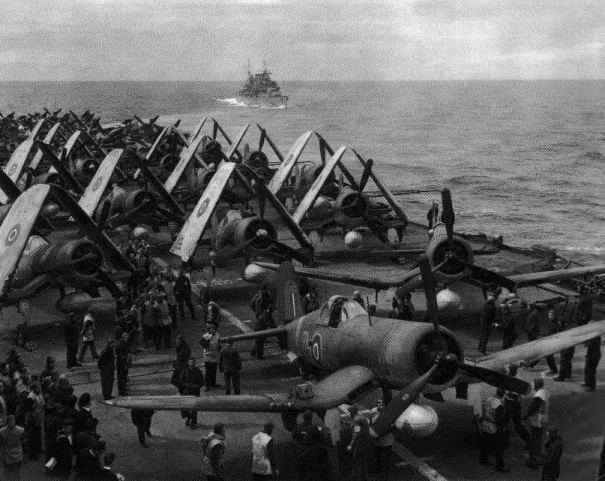 Formidable had 18 Corsair Mk. 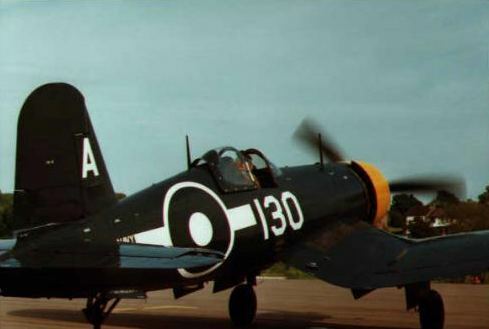 'IV's each, No.1845 attached to Nowra, Australia had 18 Corsair Mk. 'IV', No.1846 Squadron on H.M.S. Colossus had 21 Corsair Mk. 'IV', No.1850 Squadron on H.M.S. Vengeance had 21 Corsair Mk. 'IV', No.1851 Squadron on H.M.S. Venerable had 21 Corsair Mk. 'IV', No.1852 Squadron attached to Belfast, N.Ireland had 21 Corsair Mk. 'IV' and No.1853 Squadron attached to Machrihanish had 18 Corsair Mk.'IV'. The Japanese Forces named this aircraft "The Whispering Death". A total of 12,571 Corsair's were built by Chance Vought, the last one leaving the production line on the 24th December 1952. Height (Level flight position with struts extended): 15ft. 3.775ins. Height (Tip of propellor at top, three point position): 15ft. 0.79ins. Fuel: AVGAS. 301 gallons. (197 gallons in main tank and 52 gallons in each wing). Armament: Three Browning .50 calibre machine guns in each wing.